Hey guys! It's time to flaunt your red! 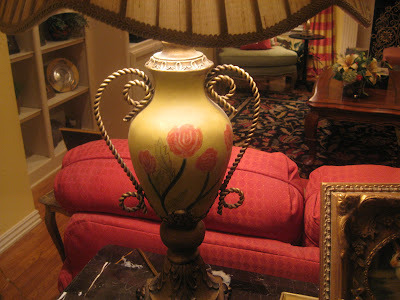 What a fun event hosted by Nancy at http://southernlady-nancy.blogspot.com/ Pay her a visit for a list of other participants. when I was going through my house to hunt for red I realized I've showed you guys almost everything! lol... I still have a few things left, but I will save them for a later post. I know I have this arrangement posted already, but I added those big red passion flowers. I found them at Pier 1 the other day and bought a few stems. Aren't they beautiful?! This is my favorite lamp. I found it at a closeout store for about $50 and snatched it right up! 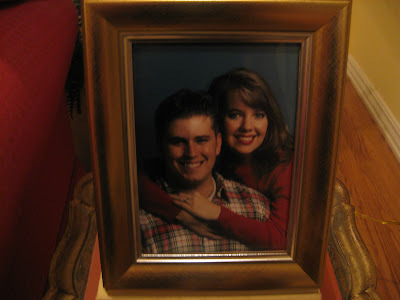 Hubby and I in our red about 10 yrs. ago. Now the wrinkles are setting in! 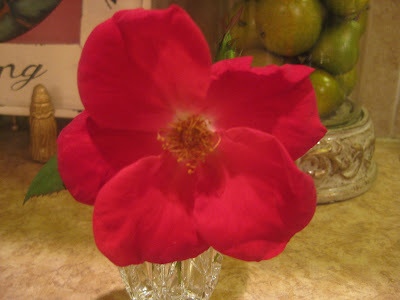 A sweet little girl across the street picked this rose at her grandmother's house for me. She knows how much I love flowers and helps me plant sometimes. It looks pink, but is really bright red. Bye for now! 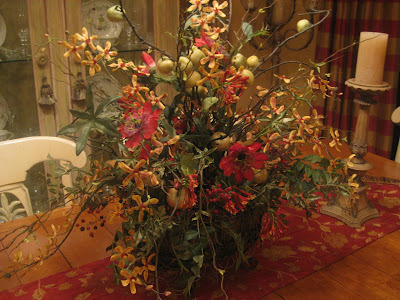 I will be participating in the Porch and Patio Party hosted by Barb at http://gritsglamour.blogspot.com/ on May 5. I have lots to show you and I'm anxious to see everyone else's patios too! It's going to be fun! 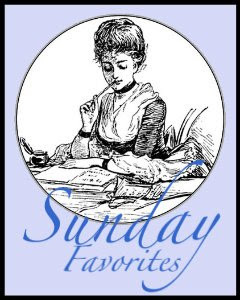 Welcome to the first ever "Sunday Favorites" hosted by Chari at http://happytodesign.blogspot.com/. What a great idea to show some of our favorite posts from the past! She is such a wonderful lady, please pay her a visit for the list of participants. Hi Everyone! 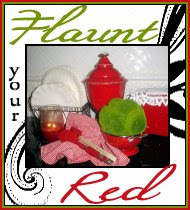 It's time for the flaunt your red party and I have plenty of it :) lol! 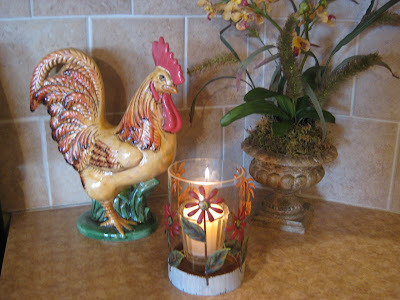 This fun party is hosted by Nancy at http://southernlady-nancy.blogspot.com/. Her blog is a Must Visit. She has so many great ideas and sells beautiful tassels in her Etsy Store. I've been visiting her blog for a long time now and am always excited to see what she is up to. Pay her a visit! Now for all my red.....Some of you have seen lots of pictures of my house already. Pretty soon I won't have anything to show you! My house is only 2100 sq. feet, which is fine for us, but I don't have tons of space to work with. As you can see I love red, maybe I have a little too much, but it just makes me feel happy! I've had the sofas since we moved in over 4 yrs. ago and I'm not tired of them yet. I might be in a few years, but they are still in great shape and fit in perfectly with all the decor. I bought the runner at J.C. pennies and added the fringe on the ends to dress it up. 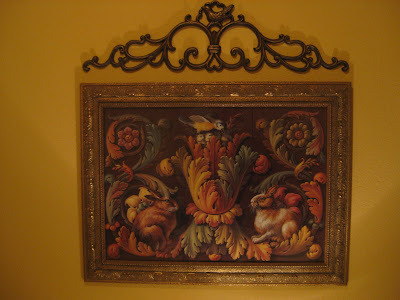 I ordered these pictures at Dallas Market when we first moved in, they were supposed to go on the sides of the china cabinet, but looked better here. Some of you probably remember Puddin from RMS. She is the one who suggested these red pillows. Yip! They're all silk! I just have to dust them and they never die. lol! This picture hangs in the hallway. It was a gift from my aunt Pat. I'm dying to show you some of her decorating. She decorated the offices at the family food business and they are gorgeous. I'll post some pictures sometime. I posted this for Kim at http://kimsdomesticbliss.blogspot.com/ after all it is red! 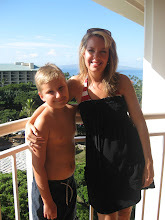 She just started a blog not to long ago and is really sweet. I could not find anymore of the crocodile paper like I used on Mellissa's and Barb's, so I used striped red tone on tone fabric. These will sell in my Etsy store for $25 plus shipping. Leave me a message if you would like one and I would be glad to customize it for you. I have more frames on some of my previous posts if you would like to see them. 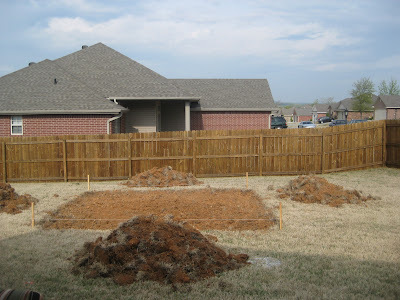 Things yet to do: Add stepping stones out to new patio, find trees, find outdoor furniture, add landscaping around patio, finish planting flowers in front yard. Hope the budget lasts for all of this! 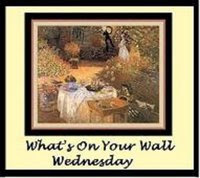 What's On Your Wall Wednesday! 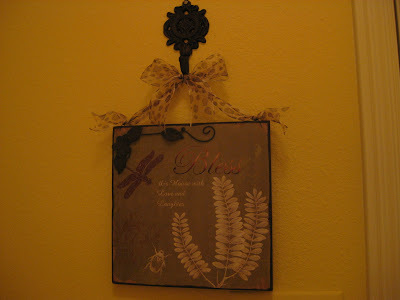 Welcome to What's on your wall Wednesday hosted by Barb at http://gritsglamour.blogspot.com/. Be sure and visit her and a list of the other participants. What a great event!! Today I thought I would show you my teeny tiny laundry room. I think it's about as small as you can get! 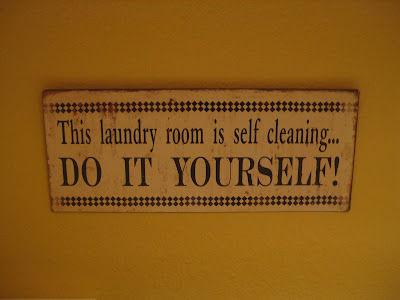 That's ok, it's just for washing anyways so I'm not in there alot, lol.....Can you tell I don't like washing clothes? I know some of you ladies probably don't mind it, but I just dread it! But if we want clean undies it must get done!! I love this rabbit picture. I ordered it a long time ago at market and recently added the iron topper. I found this little hanging plaque at my store.....Yep! Hobby Lobby. I found the iron hanger there too and added the leapord print ribbon. I think this cost a whopping $6 for the whole thing! Everything was half price. This wall was empty forever! I finally found these pictures at JC Pennies. Guess where I got this????? And this??? It's great if you can remember to hang your keys on it. 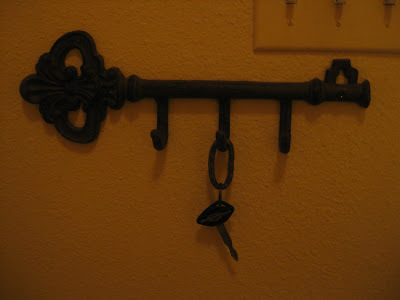 I have it on the wall right when you come in from the garage and we still search for our keys! This is the way I feel! He He!! HL again......They just have such great stuff!! There are really not any other places (reasonable) around here except for T.J. Maxx and Tuesday Morning. I don't think their stuff is as cheap as HL when they have the half price sales. You just can't beat it! 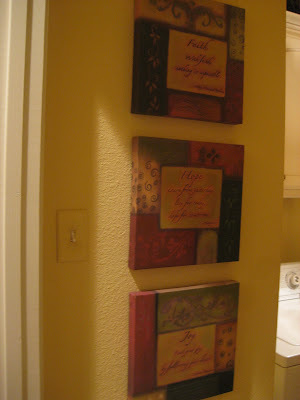 Well, I think you have seen almost everything on every wall of my house! The only thing I haven't shown you is my master bath. I'm looking for a shower curtain to hide the ugly shower. I might have to have something made, I will post it some time though. Have a great rest of the week! I'll be busy working outside, it's supposed to be in the 80's for the next several days. Yipee!!! Now that the weather is getting nice it's hard for me to sit at this computer. So much to do! I've been checking out all of your blogs this morning, lots of great stuff and wonderful recipes. I'm going to be copying them down. Talk to you guys soon!! Hi guys! Well, spring is officially here, but here in Arkansas there is a freeze warning for tonight. Maybe the warm weather will be here to stay soon! 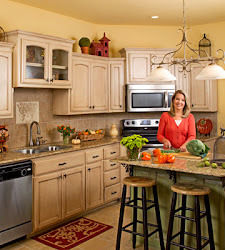 I just wanted to show you a few things I've done to spring up the kitchen. 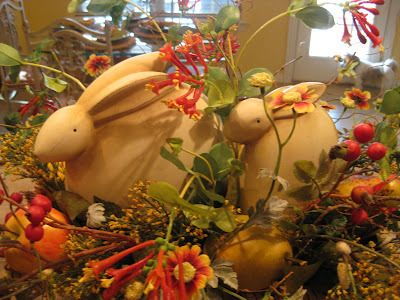 You might recognize the rabbit arrangement from my header. 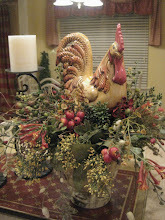 Remember this rooster arrangement I spruced up for fall? 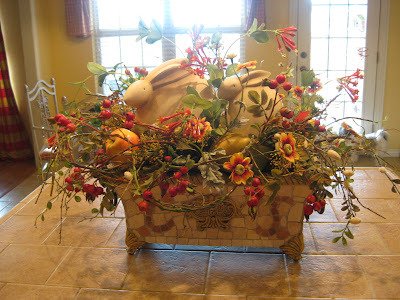 Well, I used the same flowers, just changed the container and added the rabbits from pier 1. 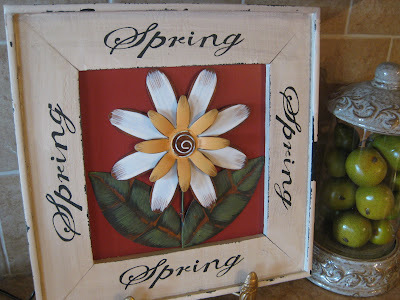 I got this "Spring" sign at Hobby Lobby half off. It can go outside, but I like it in the kitchen. These tulips were so pretty and they lasted for quite a while. I recently changed the fabric on these chairs. 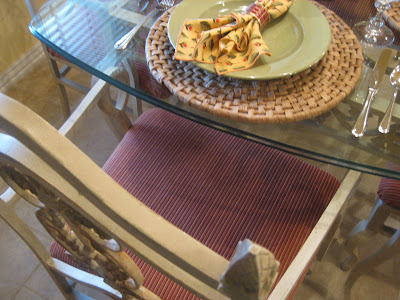 I liked the fabric fine, but a few of the chairs were stained and I layed a glue gun on one of them. Ooops! I guess the fabric was discontinued because I couldn't find it anywhere. 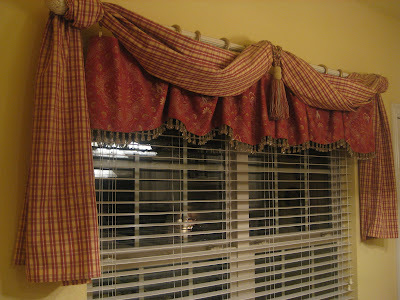 I changed it to this red and gold striped fabric. It was easy, just stapled it on! 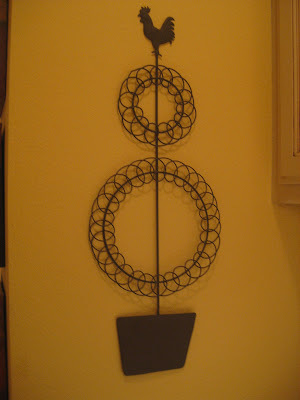 This cute candle holder came from Hobby Lobby too. Yes, the birdhouse came from guess where? Hobby Lobby. I'm sorry if you don't have one in your town. I don't know what I would do without it! 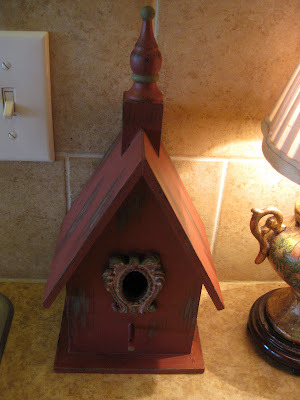 This birdhouse was solid red, I painted the green and yellow on it to give it a little more color. Things are coming along on the patio, I'll be posting it before long. 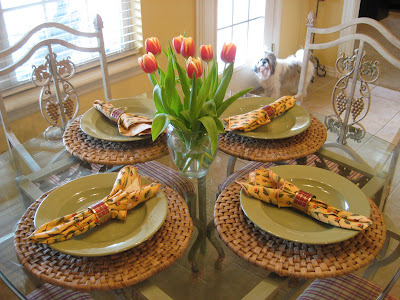 I also have an easter tablescape I'm working on for tablescape Thursday so be sure and stop by! Have a great week! !